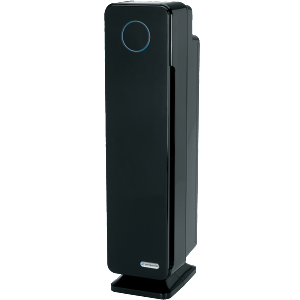 GermGuardian - AC5350BCA : Air Purifier Review • The Air Geeks, reviews of air conditioners, dehumidifiers and air purifiers. When was your last time you dreamed of an excellent place filled with magnificent and calm breath like the Caribbean island breeze? You don’t have to worry any longer; the long awaited solution is here with Guardian Technologies. The company has produced its finest outstanding air purifying machine called theAC5350BCA. Its efficiency in refining your house air is indisputably incomparable with other models this size. This review shall highlight Germ Guardian air purifier traits, pros and cons, and reviews. Eventually, a brief summary shall be provided to consolidate our review into an useful coherence. Let’s go! Holy GermGuardian AC5350B 4-in-1 Air Cleaning System! 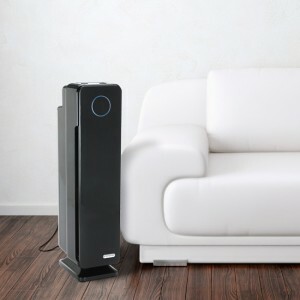 The Germ Guardian air purifier is the latest air purifier product from Germ Technologies. It presents itself with original design and elegance to fit the demands of the modern consumers who desperately flamboyant love posh and living. Whether you own congested small quota or a mansion in Malibu, its 28-inch tall makes it feasible for you to fit it excellently to your house. Does your house turn out to be a hell of dust, plant pollens, mold spores and pet dander especially after thorough cleaning? Well, True HEPA technology sandwiched in the machine clears out almost 99.9% of these pathogens. Perfectly fit with True HEPA,Odor Reduction and UV-C Sanitizer technology, GermGuardian is a universal air cleaning machine for families. Unlike other les reliable air cleansing brands, GermGuardian AC5350B 4-in 1 cleaning machine is highly portable, stylish and sleek to add splendor to your interior house design. Activated carbon filter. Over the years, it has been hectic and more difficult to control germs, molds and bacterial growth in the house. Not only does these pathogens become a mess but also trigger dangerous sickness. However, Germ Guardian is integrated with Charcoal filter to paralyze the growth of these bacteria to set you free and vulnerable to inevitable bacterial-causing ailments. Powerful UV-C Technology. Microscopic airborne germs cannot easily survive or find their way in your house! Titanium dioxide has been made to work perfectly with UV-C light technology to extricate any presence of airborne germs. With the former air cleaning machines, it was difficult to know when your filter gets congested with dust. Germ Guardian air purifier contains indicators to admonish you when to change UV bulb or the filter gadget. It is paramount to know that the filter should at least take six-eight months before replacing depending on the task force subjected to the machine. Eradicating funny smells. Have you ever stormed in some people houses and the next thing you want is to gush out like a lightening due to doggy, repulsive and nauseating smells? Worry no more of the house! This air cleaning machine has a UV-C light that decomposes these odor molecules/atoms from pets or smoke. its digital enabled controls. People are desperately tired of analogue based technology, and digital world has taken the throne. You don’t have to stay in a stuffy, pungent, putrid or redolent house because the remote control’s batteries are done. The machine is now digitalized to help you live in a flowery, fresh and fragrance filled environment. Ultra quiet operation Some people can’t catch even a siesta when there is buzzing sound of anything. This time round you are assured of quiet sleep till morning since Germ Guardian machine is fit with five fan speed to give you a wide speed options. Sleek, elegant design. It looks like an expensive speaker,while remaining very inconspicuous, which is rare with air purifiers. Efficiency. The machine works rather quicker and when placed in a stuffy room, two to three hours are enough to transform the home to a. Silent operation. An important feature of this unit is its silence. Thanks to Guardian Technologies’ experience with air purifiers, you can work, play or even sleep next to the unit. The unit is fragile. The machine is very sensitive and if it falls accidentally, its internal parts may be destroyed. Looking for that purifier, which is convenient, reliable, precise and accurate? No more search, this is the ideal purifier for you, easy to operate, the Germ Guardian AC5350BCA unit is designed with a modern style and flamboyance. Professional oriented with reliable long working hours and a machine that can’t let you down. Germ Guardian AC5350BCA offers all in one package.